Marion "Bernice" Towpich - Edmonton's Burial & Cremation Professionals | Trinity Funeral Home Ltd.
Bernice was born in Halkirk, AB. Survived by daughter, Betty Kril, grandchildren, Joy Jensen, Sandra Hartel (August), Darcy (Joanne) Christiansen, Roxann (George) Nathanail. Also survived by Great-Grandchildren, April (Bob) Wiebe, Jennifer (Jay) Martinez, Steven Jensen, Colton Hartel, Janelle (Jesse) Hartel, Jeff Christiansen, Stuart (Janelle) Christiansen, Amanda (Kris) Nathanail, Danny Nathanail, Steph Nathanail, Russell Christiansen, Jocelyn Christiansen, and Great-Great Grandchildren, Dawson & Ciara Wiebe, Presley, Jessie and Dylan Martinez, Kailey Hartel, Melody Christiansen. Also survived by sister Alice Lowis, Ray (Jill) Fowler and Jack Fowler and numerous beloved nieces and nephews. Predeceased by her parents, Gordon and Delia Fowler, daughter Myrna Roggeveen, Grandson Marty Christiansen. Brothers, Don, Jim, Harry and Gordon Fowler and sisters, Helen Yard, Marg Zankl, Dorothy Hampton and the love of her life, George Grover. Bernice was instrumental in getting the Charter O.O.R.P. #211 in Castor in 1957. She worked for Ray Wiart in Castor for 22 years in the Magnet Store, until she moved to Calgary in 1972. She worked for Holt Renfrew for over 10 years until retiring in 1983. She was very active in dancing, square dancing, crafts and Royal Purple Lodge. She modeled period costumes with Memory Lane Fashions for a number of years. In lieu of flowers, if so desired, donations may be made to Greater Forest Lawn Seniors Centre or Alberta Heart and Stroke Foundation. Be thankful for our many beautiful years! But now it’s time I travelled on. It’s only for a time that we must part. Though you cannot see or touch me, I’ll be near. All my love around you soft and clear! I have known Bernice since 1949 when we would go to coffee together from our respective jobs and go out dating together. She was so much fun and always so kind and cheerful.We have kept in touch over the years and I was so looking forward to seeing her again this summer when my daughter and I are planning another trip to Alberta. We saw her two summers ago and had a lovely visit with her even though it was brief. So saddened to learn of her passing. My and my daughter’s sympathy go out to the family and I shall miss our yearly Christmas letter exchanges. Bernice led a long and varied life. 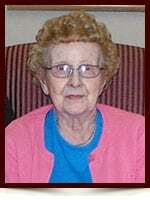 As a teenager on the farm she drove a team of horses; in her working life she met many people when working in the retail stores; she was an avid member of the Royal Purple; after she retired she was part of the community at the Forest Lawn Seniors Centre. At all times people admired her friendliness, cheerful attitude, and her willingness to lend a hand. A great example for us all! Such a great loss for her family, our sympathies to them all. My deepest sympathies to Aunt Bernice’s family. She was one of the most resilient people I ever met. She was an inspiration and helped me in many ways. She will be missed but never alone. My deepest condolences to the Towpich family, may you find comfort in prayer and the beautiful words of Isaiah 25:8 where God promises us that He will soon cease all death and suffering. Grandma was a very influential person in my life. I will continue to try to be as positive and loving as she was. We loved having her with us here in Edmonton for the last 5 years. I will cherish all the memories we have made over all the years prior to her moving here as well. Whenever you went anywhere with Grandma and you met someone she knew, she always introduced us so proudly.